In late November of 2010, Karen and I were officially accepted as pre-field missionaries with Mission Aviation Fellowship (MAF). This momentous occasion occurred in year 11 of a 10 year plan that we had put in place when we were engaged to be married back in the fall of 1999. Ever since day 1 of this journey we have never felt that God was asking us to go to a specific place, only that He was asking us to serve Him in mission aviation. This has led to many interesting discussions with people over the years, as well as many wrong assumptions about where we will be going to serve. One of our most frequently asked questions is "Where will you be going?" Many of our friends have moved on to fly in Papua New Guinea, and among our group of friends here in Three Hills it has almost become a bit of a routine occurrence that when someone gets accepted with MAF they will be going to PNG. We will not be going to PNG. 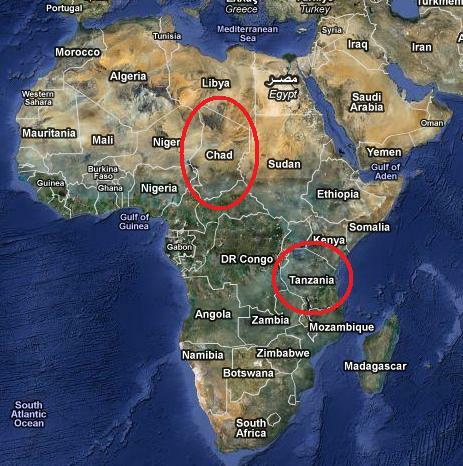 At this time is appears that we are headed for the continent of Africa, specifically Chad or Tanzania. Another frequently asked question is, "When will you be leaving?" Our time line is a little bit dependent on several things. First, MAF requires that we have 100% support before leaving for the mission field. The nuts and bolts of this is that the faster the support comes in, the faster we will be leaving. The other factor in our time line has to do with language. A placement in Tanzania does not require us to have any language study prior to leaving Canada. If we do end up in Tanzania we will be learning Swahili as we live there. A placement in Chad means that we would be going to Quebec for 6 months for language training as French is the common language spoken in Chad. This would bump our departure from Canada (not from Alberta) back 6 months. Another language that we may end up learning if we go to Chad would be Arabic. This would not be a requirement for living there, but if we would end up living in Chad for many years it would be great to be able to speak Arabic as well. I would think at this point that we would only begin learning Arabic seriously after we became quite fluent in French. Neither Karen or myself have ever attempted to learn another language and so it is a great unknown. We may struggle hugely with it or we may catch on very quickly. We don't have any expectations when it comes to language learning. Of course it would be great if it did come quickly and easily, but we won't know until we actually try it! We appreciate your prayers with regards to our placement. It would be great (especially for our kids) to know where we are going to be living, and knowing would enable us to prepare the kids and begin learning more intentionally about the place where we will be living in. We would also ask that you would pray that God would give us a deep love and vision for the people that we will be ministering to. Thank you to all of you for allowing God to use you through your prayers and support as we continue on with this journey of faith and obedience.